Have you ever been disappointed in God? Maybe He didn’t answer a heartfelt, selfless prayer on behalf of someone else. Perhaps you’re suffering for doing the right thing and you feel like God let you down. Maybe you just get fed up seeing the disarray of the world and wish God would do something to prove Himself. Well, I have news for you. In this world, God chooses to remain small. Back in the Old Testament, God had a few really glorious moments. I’m talking Hollywood worthy. That whole scene with Elijah and the false prophets of Baal was spine-chilling when God sent fire from heaven to burn Elijah’s altar that was drenched with water. There was also the dramatic rescue of the three men in the fiery furnace, as well as the rescue of their friend Daniel from the lion’s den. Oh, and let’s not forget the climactic parting of the Red Sea with Moses and the Israelites. And let’s face it, we love that kind of stuff. It shows how powerful our God is. But He doesn’t do that very often, does He? Even in the Old Testament He didn’t always show His might like this. He didn’t always swoop in at the last moment to save them. His prophets were mistreated and He didn’t intervene. Some even died for their faithful witness, and to the pagan world, it just proved that God was helpless. Now, lest you despair, consider this: Jesus Himself embodied this very philosophy. He, the Son of God, whom angels worship in heaven, chose to become weak for our sake. He entered this world as a single cell inside Mary’s womb. He was born as a helpless infant, unable to do anything for Himself. Not only this, but He was born into the most lowly of circumstances. He wasn’t born to a wealthy king and queen, laid in a soft bed with silken cloths. He was born to a poor couple in an unfamiliar town in a stable. He laid His head on rough straw in a feeding trough for animals. His welcoming committee was a group of lowly shepherds, dirty and unwashed from being out in their fields. That, my friends, is weakness. That’s choosing to remain small. But Jesus didn’t stop there. Not only did He have a humble beginning, He chose as well to have a humiliating end: death on a cross, a punishment reserved only for the most vile and wicked criminals. He wasn’t the Savior the Jews of His day expected. They wanted a powerful God to swoop in and lead an army to conquer those cruel Romans for them. But that’s not what God had in mind at all. He was looking at something far bigger than they could ever imagine- He was looking at eternity. They, on the other hand, just wanted out of their current but temporary earthly situation. God chose to remain small so He could gain for them an eternal victory, where He would indeed reveal His power and might. In heaven, we shall see Him enthroned in all the splendor and majesty due Him. But for now we wait. 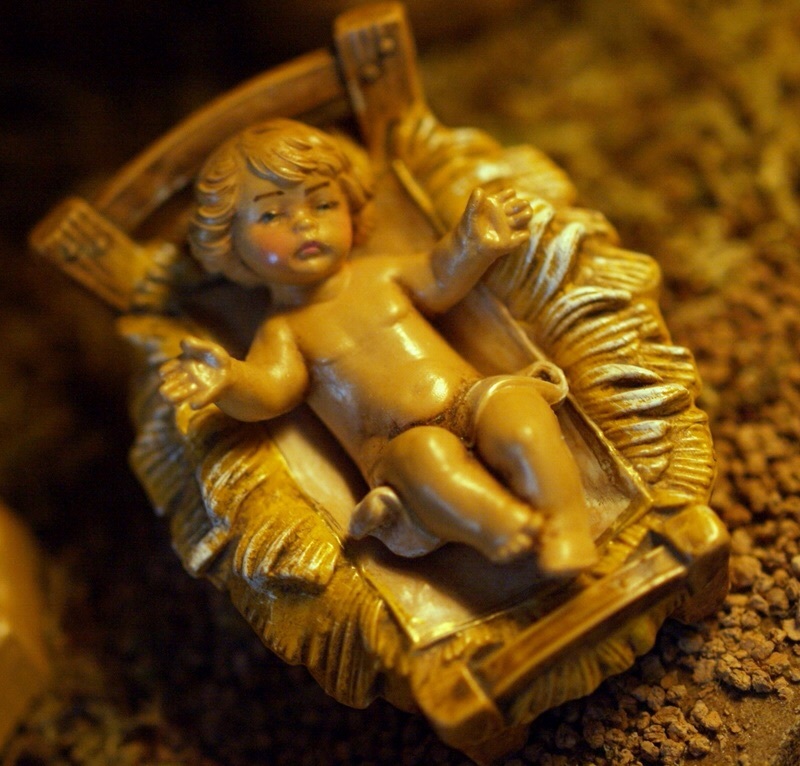 This Christmas, take some time to reflect on the “smallness” of God. Think about that helpless baby in the manger. Let the words of See in Yonder Manger Low sink in- “See, in yonder manger lies He who built the starry skies…” Remember that God often chooses to remain small, because as Paul was assured in 2 Corinthians 12:9, “[God’s] power is made perfect in weakness.” The infant King in the manger is proof of that. Blessed Christmas!